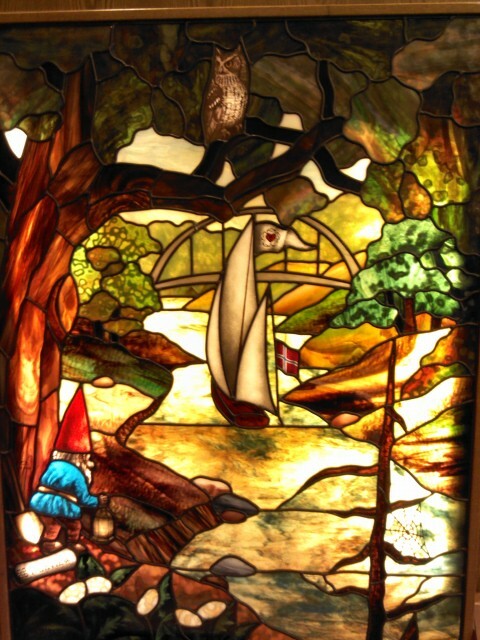 This stained glass panel is next to the admissions desk at Fairview Southdale hospital. During Lucy’s hospital stay, I have parked in the Skyway Ramp and I walk past this stained glass panel every day. The flash on my phone’s camera causes a lot of flare. The gnome is not lighting flatulence (though he looks guilty) and the owl is not looking for the culprit. I believe Lucy saw the movie referenced in the post title. The book it was based on was an optional choice for my World Literature II class at Augustana College. I didn’t read it because it was optional. Lucy took a short walk this morning. It helps clear the fog of the pain pills. Her leg color has gotten noticeably better in the past day. Her right calf circumference is within 3 cm. (about 1.2″) of her left calf. She says that her ankle is stiff but is getting a bit more range of motion. Lucy has worked on her physical therapy exercises. Her Braden risk bracelet got removed because she is more active and her skin can air out. Dr. Singh from Minnesota Oncology came by. Lucy moved back to 8th floor this afternoon. Her hemoglobin dropped after yesterday’s increase so she will get a two-unit transfusion. This means the four transfusions she has had since admission have required eight units of blood. She will be here until Monday at the earliest. The rest of the blood work sounded OK. Her Coumadin dosage got dropped to 2.5 mg and they did not have to administer a quick “blast” of heparin (called a bolus). We hope this means she is getting close to removal of the IV heparin and her Coumadin dose is getting set. I did get to take Lucy to the Meditation Sanctuary before she moved to 8th floor. We used a wheelchair because it was a quick trip. She liked the fireplace and water feature. Changing her scenery also helped. The view from her room is great. For those of you in the Twin Cities area, she overlooks Crosstown Highway and France Ave. The fog lifted and the sun came out and we can see all the way to Highway 100. Lucy’s birthday is tomorrow and she will be spending it in the hospital. I’m grateful for getting to celebrate another birthday with her! I do wish she were released today. Comments are working, so please feel free to send her birthday greetings tomorrow. Thank you so much for your support!